Authors, travelling around schools, see stuff – stuff that inspectors would never see or even bother to look for, because inspectors are looking for what they want to see. I keep seeing the Green, Amber and Red colours of testing software printouts. This software works out where to put the most resources to achieve the best test results. That sounds like a reasonable proposition, but in truth it confirms that the current education system is structurally designed to promote failure. Test results are all that matter. The education and-life chances of the children in the system come second. The “customer” – the child being educated – has been taken out of the equation. If your child is in the green area then you are doing the right thing. You are helping them with homework, encouraging them to read and providing them with a full and diverse cultural feed. They will learn to read despite being at school. If your child is in the amber areas, then it is worthwhile for the school to put effort into raising your child’s reading levels one or two grades. You can do this easily at home by reading to them in bed every night and showing some interest in their homework and schooling. The school can feel confident that if they invest time and resources in this group, they will bring their overall target levels up. The education system has such a distorted view, nothing else matters but the levels. If your child is in the red area, you probably don’t care, and neither do the school. They know that it will take a huge effort to raise these children up just one grade, that will not have any effect on the school’s overall performance. These are the children that are doomed to illiteracy – they will cost the country a fortune over their lifetimes in social and medical care, prison and welfare. But that does not matter because because meeting reading level targets are more important. The chances are that red area children have no books at home. The amber area children may have up to ten. The green area children could have over 200! Before arriving at school, green children can have heard over 30 million more words spoken than a child in the red area, who may never have sung a nursery rhyme at home, had a book read to them at bedtime, used a knife or fork and my well have not learned to use the toilet. Children’s centres were supposed to help with early years intervention. But children have to leave the centres to go to school and start learning to read. If the stats say it’s not worth schools bothering with children who need too much time spent on them, then it’s not worth spending the time on them. The recent report of Britain’s failing literacy standards bears all this out. After 14 years of the Literacy Strategy and the National Curriculum someone needs to hang their head in shame and admit they got it all wrong. After 14 years, literacy should be at 99% of all school leavers. So where has it gone wrong? Literacy has been redefined as the ability to decode text. That is not literacy – that is a boring, wet, grey, Wednesday afternoon lesson. Literacy is the ability to read. How have we forgotten that? Reading is the one core skill. Without being able to read, forget about writing and “‘rithmetic”. No child should ever be allowed to fall behind in reading skills. That should be the core statement of education. If children can’t read, don’t progress them onto subjects they don’t have a cat in hell’s chance of understanding. And how do we promote reading? The cryingly, simple, obvious solution is to read books! Hundred’s of them and if children don’t hear books read to them at home, they need to hear them read in school. Thanks to targets, there is no time for telling stories in school anymore. The key to reading is not phonetics or any other fashionable system, the key is story. Human beings are hard-wired to listen to an learn from stories. Politicians know this – they tell enough of them. Advertisers know this – story is their trade. Religions know this – Faith is just the believing of a great story. So why has education forgotten and ignored the very keystone on which it is built? It is story that draws the child closer and closer to the text, they marvel that those squiggly marks make up words that mean something, words that tell fantastic tales and explain fantastic concepts. Once the connection is made, nothing will stop a child wanting to learn to read so they can do that amazing, magic trick themselves. Teacher education is such that a whole new generation has been taught nothing about children’s books or how to read them to their children. How are we going to convert them back to story-time? Learning to read is the hardest job anyone will ever do in their entire lives. To condemn a child to the red area is to write them off, to mark them out as the detritus of society. How many times have I heard teachers say, “But what can I do? Targets have to be met.” Forget about striking over pensions – we’re all in the same boat there, so teacher’s won’t get any sympathy from the public over that, but how about striking for the right to teach? And how about hauling parents in and reminding them that they have responsibilities too? School is not a child-minding service, it’s a partnership of Family, Child and School – giving the child the best opportunities in life and preparing them to make the most of their talents so they can contribute to society. When did we ever stop wanting better for our children? What happened that all responsibility has been outsourced to over-stretched schools? The real test of education is the number of happy, fulfilled adults that have benefitted from their time at school. The target should be adults that behave, that understand the difference between right and wrong, that have the confidence to rely on their own resources, that contribute to life and society, adults who cherish the next generation and help them on their way in the hope that they will help in return when we get older. The education system that does not work for its “customer’s” best interests is broken and those in charge of setting the targets are as guilty as the red area children will be, when they grow up and appear before the magistrates in the dock. This entry was posted in books, People, Reading and Literacy, School & Library Visits and tagged Education, education failure, education reform, literacy, literacy standards, reading, school visit, storytelling, Words, writing on October 11, 2013 by Shoo Rayner. Whatever Happened To Manual Instruction? Yesterday I visited Lydbrook Primary School, here in the Forest of Dean. It was once a village school that took children up to school leaving age – Lydbrook was a mining village and many of the children went to work underground or in other manual trades. 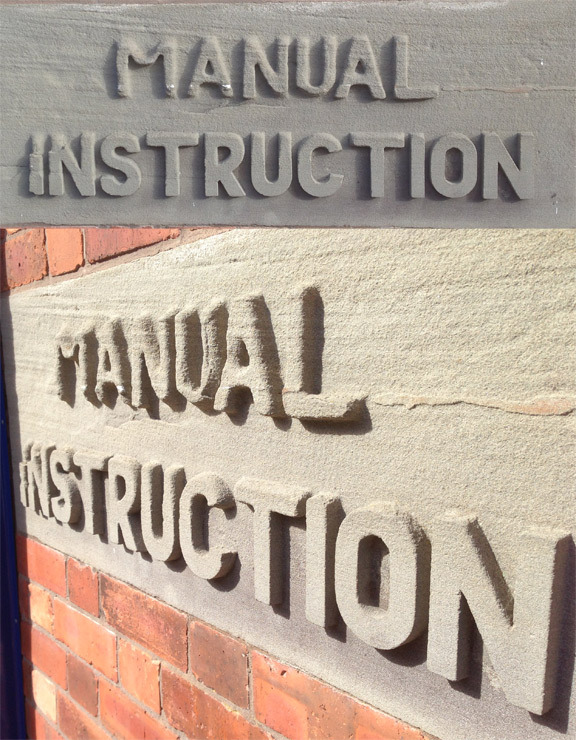 One of the teaching blocks has this fabulous sign carved from the local forest stone, announcing that Manual Instruction was taught inside. That would be carpentry and metalwork as well as cooking and other skills. How many children yearn for a building like that at school, these days? Somewhere to make something, create something and learn a real skill. A classroom where there are no written explanations or reflections, no written exams, coursework or measurable outcomes, other than the the finished object speaking for itself – just manual instruction – the passing on of skills and craft attitudes that matter in the real world those children will grow up to live in. A little bit of DT mixed into the curriculum doesn’t satisfy practically-minded children. All those essays and written coursework that the art, drama and sports department now require, only serve to put those, who are naturally suited to the subject, off pursuing them. Haven’t we had enough of political correctness forcing children to be square pegs in round holes for the sake of neat accounting? Will education ever come again to accept that one academic size does not fit all? Will we ever be grown-up enough to accept that we are not all wired-up the same way? We knew it once and built classrooms for Manual Instruction. Now that a bit of history has passed under the bridge, I can see what happened. The grammar schools gave extraordinary chances to working-class children. Those who got to Oxford and Cambridge soon came to run the country as leaders of the Labour Party, lording it over the Swinging Sixties, when almost anyone could do anything and and almost anything seemed possible. So how did those ungrateful, mean-minded politicians repay the help and belief they were given by previous generations, that worked so hard to give them a bright, new future? They closed down the grammar schools, that got them where they were, and pulled up all the ladders to advancement behind them, protecting their new-found wealth and position from any new upstarts who might come up from below and take away what had been given them in a spirit of hope and generosity. Then they invented political correctness to put fear into those who might criticise them. Rather than generally reducing children’s prospects, by creating the comprehensive schools that sought to promote the mean, wouldn’t it have been wonderful if they had followed in their public-spirited forefathers’ steps and addressed the abysmal state of secondary modern schools instead, turning them into first class academies of technology, creativity and craft, that stood on a level with the grammar schools, the two cultures working side by side? Wait a minute – that still sounds like a good idea to me! This entry was posted in People, Reading and Literacy, School & Library Visits and tagged comprehensive schools, craft, Education, education reform, grammar schools, Manual instruction, skill on September 17, 2013 by Shoo Rayner.